Not too long ago we realized that almost all new casinos were trying to come across as these serious, businessy places. Sure, some people might like this kind of style. But we caught ourselves wondering – when did online casinos get so boring? And then, like an angel descending from the gambling heavens, Fun Casino was introduced. Happy colours, fun mascots, and even more fun tournaments. Yes, yes and even more yes! We practically jumped to the sign up page and created an account immediately. After months of putting them to the test it is now time to share our honest opinion with the world. Lo and behold – our Fun Casino review is here. We’ve left no stone unturned, and will share with you the pro’s and cons of this newbie. First and foremost let us guide you through the registration process. After all – you’ll need an account to benefit from what comes after. It’s a 2 step sign up form, which shouldn’t take you more than a minute. In the first step you’ll enter your email address & password, and select your currency (EUR, GBP, INR, CHF, CAD, ZAR, SEK, NOK or NZD) and country. In the second step you’ll add some personal information like your name, age, gender, etc. When you finish this, you’ll receive the usual confirmation email with an activation link. That’s it. After that the fun can really start. After registration players receive 11 free spins, which can be played on one of the following slots: Starburst, Joker Pro, Wild Wild West or Finn & the Swirly Spin. After the first deposit players receive 50% bonus up to £/$/€ 499 + an additional 100 free spins. After the second deposit players will receive another 50% bonus up to £/$/€ 499. Something extra to look forward to at this casino is the Fun Point system. For every $/£/€10 deposit, players receive a Fun Casino Point. When you’ve collected more than 50 points you can redeem them for money. Players can check their current points, and their value, on the player points page under their account. What is so fun about Fun Casino? Nothing beats a good game selection. Compared to some other major casinos, the selection at Fun might seem humble – but that doesn’t mean you will not be entertained. Thanks to games from 4 top-notch providers NetEnt, Microgaming, Amatic and Evolution Gaming, boring is a word that is not known in the Fun Casino vocabulary. Game categories are conveniently displayed at the top of the casino. Your favourite games are only a few clicks away. For players who like to turn the excitement up a notch, there’s a wide variety of live casino games available. Fun Casino honors their name by offering a mixture of classic and special tables such as Blackjack Party, Dream Catcher, Immersive Roulette, Speed Baccarat and Ultimate Texas Hold’em. In the “other games” section players can choose between several skill and bingo games. Another concept that we love about Fun Casino is that they offer ongoing tournaments. Most casinos only offer these fun competitions once in a blue moon, but Fun Casino decided it would be way more fun to have them all the time. When playing any game, the right side of the page will display recent winners, tournaments and challenges. To view the leaderboard of a specific tournament, you’ll have to open the related game(s). When you open one of these games you’ll be asked to enter your own personal leaderboard name. Whilst we’re writing this there’s a tournament on the Amatic Slot Ultra Seven. The player who scores the best overal net win will receive €2500. As if we weren’t entertained yet, Fun Casino regularly has extra promotions in the form of challenges. In short, there’s always something fun going on at Fun Casino. VISA / Mastercard: regular debit and credit card payments. Money is added immediately. Maximum amount allowed per deposit is €1000. Skrill / NetEller/ EcoPayz: popular e-wallet payments. Money is added immediately. Maximum amount allowed per deposit is €10000. Bitcoin: globally accepted cryptocurrency. Money is added immediately, however a 2.5% service fee is calculated. Maximum amount allowed per deposit is €10000. PaySafeCard: anonymous prepaid cards that you can buy in the store. Money is added immediately. Maximum amount allowed per deposit is €1000. Sofort: pay via your online banking. Money is added immediately. Maximum amount allowed per deposit is €10000. Bank Transfer: transfer money from your bank account to Fun Casino. Don’t forget to check the bank transfer deposit page for the correct information that you’ll need. Maximum amount allowed per transfer is €10000. Bank transfers are typically processed within 3 days. Fun Casino is the latest brainchild from the people at L&L Europe. You’ll probably know them from some of their other brands like No Bonus Casino, where players receive 10% cashback every day. What we like about these guys is that they always bring something new to the table, and are above all honest and transparent at all times. Fun Casino is their first brand on which they introduced the tournaments, and is also Multi-lingual (English, Finnish, German, Norwegian and Swedish) and multi-currency. Being an L&L brand, the casino is located in Malta and thus operates under a strict license from the Malta Gaming Authority. Avid players will already be familiar with them, and know that they are trustworthy and 100% legit. To summarize. 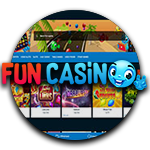 Fun Casino is highly entertaining, always has a tournament (or two) going on, offers a wide variety of games and payment methods, and is operated by a company that we know and trust. If it’s not clear by now – we definitely recommend you to give them a go and find out exactly how fun the casino is.